Posted on December 12, 2012 at 2:02 pm. 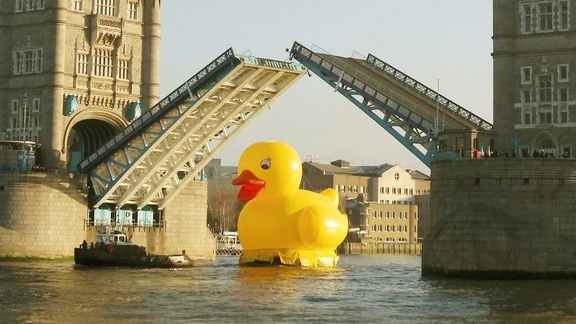 Jackpotjoy, a gambling website in London makes international headlines by floating a 50 foot duck down the Thames River. The company states that their brand message “is all about having a bit of fun and we hope to inject a bit of that daft fun into everyone’s lives – whether that’s playing a game of bingo on Jackpotjoy.com or inspiring people to do something daft ‘Just for the Jackpotjoy of it'”. This brand message certainly does resonate as their marketing team inevitably brings smiles to every person who happens to see an enormous duck floating down the Thames River. Not only did the marketing team have a great deal of fun watching the surprised and uplifted reactions of the thousands of habitants by the river, but they also pulled of one of the most cost effective brand marketing stunts of the year.